Port Costa may be a quiet place now, but it wasn't always thus. The town was born in 1879, when the Central Pacific Railroad built its southern ferry-transfer slip at the mouth of the Bull Valley. For 50 years, trains, passengers, and cargo were transported across the Carquinez Strait from Benicia. A thriving waterfront community with a wild side reminiscent of San Francisco's Barbary Coast sprang up around the ferry terminal and grew during the California wheat boom of the 1880s and 1890s. During this time, Port Costa became one of the busiest ports on the West Coast. The wheat ships and ferryboats are gone now, but Port Costa remains a popular local tourist destination for people who wish to catch a glimpse of Contra Costa County's historic past. John V. Robinson is the author of Arcadia Publishing's Crockett and Al Zampa and the Bay Area Bridges and, like coauthor Veronica Crane, was raised in Port Costa. In this volume of vintage images, Robinson and Crane have gathered historic photographs from longtime Port Costa residents and from the archives of local historical societies. 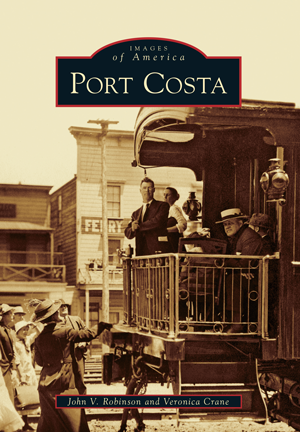 Mixed in are some contemporary images to create a compelling and lively sketch of Port Costa's colorful history.